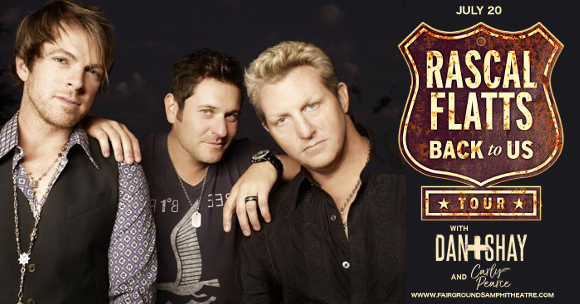 Are you ready for Rascal Flatts at the MidFlorida Credit Union Amphitheatre?? The three-piece are hitting the road again in 2018 with the Back To Us tour, featuring Dan and Shay and Carly Pearce!! Hitting the MidFlorida Credit Union Amphitheatre on Friday 20th July 2018! Don’t miss out – get your tickets now for a show you’ll never forget! Formed by Gary LeVox, Jay DeMarcus and Joe Don Rooney in 1999, country-pop act Rascal Flatts achieved huge success with their self-titled debut, with four singles appearing on the Billboard Country Charts. Since then, they’ve hit number one with a single from each and every album they’ve released!! We can hardly wait – can you?? Be quick about grabbing those tickets, they won’t last long! !